The original survival manual for new teachers and veterans. A classic book that has launched—and saved—thousands of teaching careers, with everything you need for managing the basic realities of teaching! 39 chapters to help establish positive relationships with students, help students develop responsible learning behaviors, improve organization and time management, improve your focus on long- and short-range goals and build accountability, professionalism and confidence. Yes, you’ll see references to things like dittos and filmstrips, and other technology, language, and terminology that was in common usage at the time. 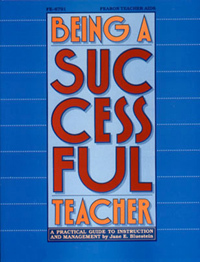 That said, the dynamics and strategies for successful teaching are as valuable and effective today as they were when this book was first written. Clear, concrete information with practical suggestions for immediate implementation. Fill-in activity pages for planning and reflection. Great for beginning teachers and seasoned veterans alike, and a wonderful gift for student teachers and recent graduates! Use your credit card or PayPal account to order Being a Successful Teacher through a secure server online. Ask for an autograph. It’s free, too! The original survival manual for new teachers and veterans. A classic book with everything you need for managing the basic realities of teaching. This book is free. The price helps cover our shipping cost.